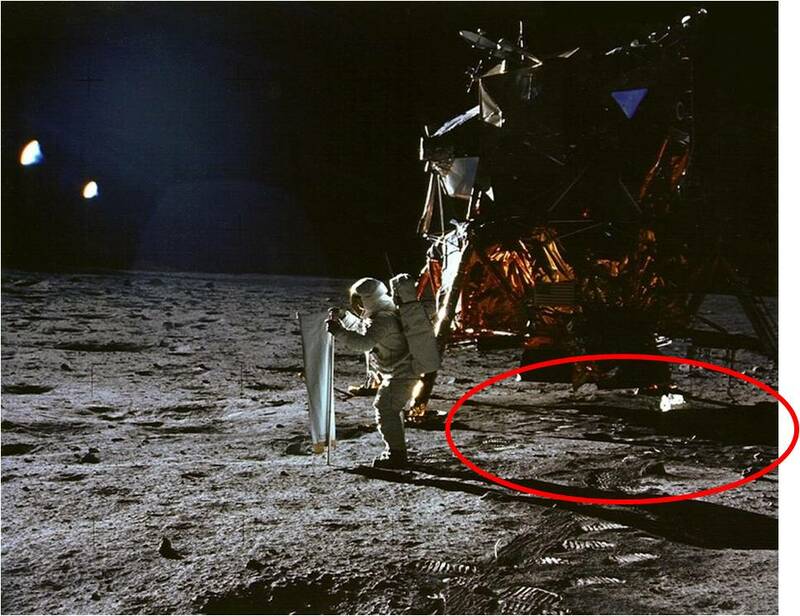 The evidence that the Apollo moon missions were faked in a studio is crushing. The US government can't censor the evidence that's on the internet but it can bury it with disinformation and obfuscation. If you enter "Apollo hoax" in Google, you'll find about fifteen pro-Apollo sites for every hoax site. I made a collection of some of the hoax evidence the government is trying to bury. At the 2 minute 35 second mark of the video the flag is still. When the astronaut goes past it, it starts to move. There's an analysis of that here in this three part series. There's a noticeable difference in the body movements in these two clips. What I hypothesize is that a fifty percent slow-motion was used in Apollo 11 to simulate lunar gravity. Later, they improved their methods of simulating lunar gravity and started using a combination of slow-motion and support wires. The slow-motion in the later missions might not have been exactly half-speed. It might have been sixty five or seventy percent of natural speed. It looked better but it was inconsistent with Apollo 11 footage. The inconsistency is apparent. At around the 21 minute mark of this video the above footage from Apollo 11 can be seen played at double speed. It can also be seen in this video at around the 30 minute 40 second mark. It looks just like movement in earth gravity. When the footage from this clip is doubled, the movements look unnaturally fast. ...combined with wire supports in the later missions. If you look at the acceleration of the object that falls from the astronaut's backpack and the acceleration of the hammer and feather that fall, it's apparent that there's a difference in the way gravity affects the objects. Evidently the slow-motion speed is different. Watch how the corner of Collins' jacket moves in this clip. It swings back and forth the way it would in gravity. Look at the corners of the jacket the woman astronaut is wearing in this clip. This is real zero-gravity and they behave quite differently. One possible explanation is that they were trying to fake zero-gravity in a diving plane and the plane wasn't diving fast enough at that point. There is no blast crater under the lander. That is discussed in this five part video series. The moon rocks are often presented as proof the missions were real. There are plausible explanations that would explain them. Well, why did they keep faking the Apollo flights, I still don't understand. Did the Soviet Union know it was faked? Why did they keep shut up if they knew it was faked? 'Cause a lot of people would think they kept the moon race going to prove the U.S. was better than the Soviet Union. If the Soviet Union knew, why did they let the U.S. get away with this? Well, I'll tell you - at the highest levels there is a coalition between governments. In other words, the Soviets said, if you won't tell on us - and they faked most of their space exploration flights - we won't tell on you. It's as simple as that. See, what Apollo is, is the beginning of the end of the ability of the government to hoodwink and bamboozle and manipulate the people. More and more people are becoming aware in the U.S. that the government is totally and completely public enemy number one. The Soviets, with their own competing moon program and an intense economic and political and military rivalry with the USA, could be expected to have cried foul if the USA tried to fake a Moon landing. Theorist Ralph Rene responds that shortly after the alleged Moon landings, the USA silently started shipping hundreds of thousands of tons of grain as humanitarian aid to the allegedly starving USSR. He views this as evidence of a cover-up, the grain being the price of silence. (The Soviet Union in fact had its own Moon program). On the domestic front, the Cold War helped the Soviet Union entrench its military-bureaucratic ruling class in power, and it gave the US a way to compel its population to subsidise high-tech industry. It isn't easy to sell all that to the domestic populations. The technique used was the old stand-by-fear of a great enemy. It someone were to make a deathbed statement saying the moon missions were faked, the press would never report it as the press is controlled. Also, it would be downright dangerous for someone to come forward. Look what happened to these guys. The astronauts look pretty nervous at the press conference. Here's a link to the entire conference. This keeps going on and offline so if this link is dead, try googling "Apollo 11 press conference". Their behavior look pretty suspicious here too. It begins in the second half of the video. The main reason they had to fake it was probably space radiation. Here are some articles and videos I've found on the subject. There is an old saying that "A liar needs a good memory". Nowhere is this more true than in the Apollo program. NASA tell lies to cover up previous lies, and other discrepancies uncovered by people investigating the Moon landings. Altering previous data, removing photographs, and retracting statements made, only re-enforces the evidence that NASA are on the run, and being forced into a corner to which they cannot escape. The actions of those under investigation makes the investigator more aware they are bluffing. The longer that person, or persons, who make the extravagant claims continue, the more lies they have to tell in order to counteract it, until it reaches the point where it becomes ridiculous. That point was passed in July 1999, when NASA officials were questioned about the Moon landings on television. They dodged the all important questions like a drifter dodges the heat. Many Apollo astronauts have long since died, as to have many of the original NASA officials involved in the scam, consequently current officials, who know that Apollo was a fake, have not quite got it right when talking openly in public. Perhaps the biggest slip of the tongue was made by NASA Chief Dan Goldin when interviewed by UK TV journalist Sheena McDonald in 1994. He said that mankind cannot venture beyond Earth orbit, 250 miles into space, until they can find a way to overcome the dangers of cosmic radiation. He must have forgot that they supposedly sent 27 astronauts 250,000 miles outside Earth orbit 36 years earlier. The Chinese space walks were obviously faked in a water tank and NASA's official position is that the Chinese space walks were real. The pro-Apollo posters at the forums of both the "Clavius" and "Bad Astronomy" websites tap danced around the evidence that the Chinese space walk was faked because they have to agree with the official US government version and they can't say it was faked without looking silly. Here are the threads. They're hilarious. They pretty much destroyed the credibility of those two sites when they didn't seriously address the evidence. It's pretty clear that they're government damage-control sites. Here's some more stuff on Clavius and Bad Astronomy and Jay Windley. Here's some good research if anyone wants to delve further. Page generated in 0.04542208 seconds (87.32% PHP - 12.68% MySQL) with 34 queries.